Open Source Web Applications for Libraries by Karen A. Coombs and Amanda J. Hollister | Information Today, Inc.
"Coombs and Hollister make some of the most important open source applications accessible and understandable. Although this is a great introduction to open source applications in libraries, even experienced technologists can learn from this book. Getting started with some of the most important open source applications for libraries cannot get any easier with this book. This book will save you many hours of time learning about open source applications important to libraries. Coombs and Hollister distill the essential information for you and present it in a way that is easy to follow and understand." Interest in open source software has never been stronger, yet a general lack of information about specific tools and benefits—along with nagging concerns about dependability and support—has hampered adoption in libraries. 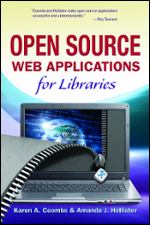 In Open Source Web Applications for Libraries, authors Coombs and Hollister address these issues and provide librarians with guidance on a range of applications that can be used to improve reference services, instruction, and outreach to library users. In addition to explaining the use, installation, and configuration of such popular resources as WordPress, Drupal, Joomla, and MediaWiki, the authors cover library-specific open source applications such as SubjectsPlus, Blacklight, VuFind, and SOPAC. They compare and contrast the applications, describing key features, strengths, and weaknesses in order to help librarians make informed decisions. Numerous real-world examples illustrate how different types of libraries are using open source web applications today. "Coombs and Hollister have given the library literature something it has needed for some time: a thorough and understandable guide to open source software for Libraries. Open Source Web Applications for Libraries is a tool that I wish I had access to early in my career, as it gives not only the lay of the land for web applications for libraries, but also the information needed to make intelligent choices about them."